Two photon QED process, producing low-energy electrons and positrons that will hit our detector. When we make measurements in physics, we are always interested in a signal. Background is what makes our life harder: Things that do not belong into the signal category, but still show up in your measurement. In the case of the new silicon pixel detector we are developing for BELLE-II, background are hits that we see in the detector, which come from particles that do not belong to an interesting physics event. Actually, most of the hits will be in that category. Now, this is not really a problem as long as you can associate the right hits to particle tracks of interest, which works since we have detectors that see much less background than ours will, which then will help us decide which hits are good and which ones aren’t. However, this scheme works only as long as there is not too much of the background. And that is of course the key issue here: How much background do have to expect? After all, the accelerator for the BELLE-II experiment has not yet been built, so we can not measure it. We have to extrapolate from what we know from the present KEK-B collider, where the BELLE experiment operates. This is a complicated business: The new collider will have a factor 40 higher luminosity (interaction rates), so we have to extrapolate quite a bit. There are several types of background, for example beam-gas interactions (particles coming from collisions of beam particles with gas atoms in the beam pipe, due to the non-perfect vacuum), synchrotron radiation and Touschek Background (coming from electrons which stray of their nominal path in the collider due to intra-beam scattering). Those two strongly depend on the accelerator parameters, such as the beam currents, focusing, and so on. Usually these types of background are the dominant contributions. And by clever designs of the machine and its operational parameters, they can be reduced to tolerable levels. And most importantly: They don’t usually scale with the luminosity of the machine. 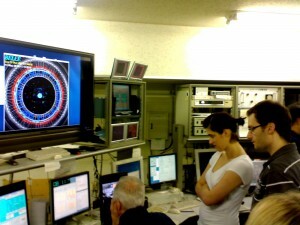 Members from the Munich team, including my grad student Andreas, looking at first events of our background run in the BELLE control room. But then there are other backgrounds which come from reactions of the colliding particles. Those are irreducible since they scale with luminosity, just as the signal we are interested in. And something that is totally irrelevant in the present BELLE detector might become a show stopper, or a serious headache in BELLE-II, once the luminosity (and the rate of these backgrounds) has increased by a factor of 40. The biggie here might be two photon QED background, which produces low energy electrons at high rate. In principle this can be calculated, but it is complicated. Predictions varying by a factor of 10 exist for BELLE-II. The high end of the predictions are a problem, while the low end are no concern whatsoever. So our goal is to measure the amount of QED background in BELLE, to figure out which of the predictions is right. The tough thing is that the QED background is swamped by beam gas and other things, so we have to work hard to tease it out. 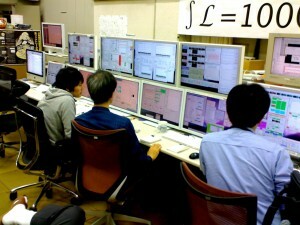 Accelerator experts in the KEK-B control room, working their magic. What we did on Friday, in one monster effort lasting from 8 am in the morning to 1 am Saturday morning, was to vary the luminosity in BELLE in different ways which might affect the QED background and other backgrounds in a different fashion, allowing us to extract the contributions of the different things, or at least give us an upper limit. This required a lot from the machine operators, who had to operate the collider outside of its usual parameter range. And the experts really delivered in a way that still amazes me. They really understand their collider in all detail. For us, it was an exiting study, and one of the last chances to participate in the running of the BELLE experiment before it will be shut down and dismantled in the summer to make space for BELLE-II. Of course it was also a very tough day: at some point after 8 pm, without any breaks, all that kept me going was hot espresso out of a can… The wonders of Japanese vending machines! 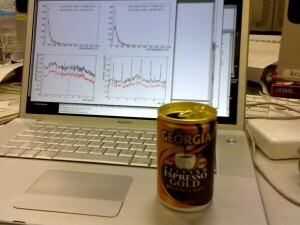 Staying focused after 14 hours of work: Fast offline data analysis, fueled by espresso in a can. Now, the analysis is just starting, we got some hints already during data taking that the worst-case scenario very likely is not the right one, and I put in a few hours on the laptop on the plane. But hard numbers will be hard work, and will take quite a while… As usual in high energy physics!